Join the regional demonstration against the Immigration BIll in Sheffield on December 18th, International Migrants Day. We will also be meeting before the demo at 10.30am 18th December at the Northern Refugee Centre office in Sheffield to make placards and final preparations for the demo. We hope that you and your organisation will support this regional protest, on Wednesday December 18th in Sheffield, against the latest Immigration Bill which was described by Theresa May as aiming to “create a really hostile environment” for people she calls “illegal migrants”. The main results of the Bill – if it becomes law – are…. · That private landlords and banks should check the immigration status of prospective tenants. But understanding immigration status is complex. This will lead to racial profiling and discrimination. · To limit appeal rights and an increase in appeals that can only be made from abroad. But Home Office decision making is poor – 40% of appeals succeed. Taking away the right to appeal will make the system even more unfair. · A charge on all migrants, without indefinite leave to remain, for use of the NHS. This idea is based on the myth of health tourism. But migrants are more likely to being working in the NHS than using it: 30-40% of all doctors and nurses were born outside the UK. Representatives of five of Sheffield’s migrant-rights and support groups met Deputy Prime Minister Nick Clegg in his Sheffield constituency office days after the Immigration Bill had its second reading in Parliament. The Bill, introduced by Home Secretary Theresa May, aims to “create a really hostile environment” for people she calls “illegal migrants”. In particular it proposes to charge migrants for healthcare and reduce migrants’ access to appeals. Just before the last general election in 2010 SYMAAG sent an “Asylum Election Pledge” letter to all candidates in South Yorkshire. The letter was backed by 30 refugee community organisations, campaign groups, faith groups and trade union branches. Nick Clegg was asked if he would “Give those seeking asylum full access to healthcare”. His response to us on 22nd April 2010 was “we support the concept of improving the provision of healthcare”. When asked if he supported “adequate legal aid and enough time to make legal representations” he replied “we are committed to retaining the right to appeal for those whose applications for asylum support have been turned down”. Carita Thomas, ASSIST and South Yorkshire Refugee Law and Justice. We opened the meeting by expressing our general concern about the Immigration Bill which was proceeding through Parliament at a rapid speed and was currently in its Committee Stage in the Commons. We were particularly concerned about three aspects of the Bill: the NHS angles, the proposed checks on immigration status and the removal of appeal rights from migrants. Immigration Bill – NHS angles. We had held a meeting attended by more than 60 people at which many misgivings were express and a strong resolution had been passed unanimously. We did not believe that the Government had established that ‘benefit tourism’ was a sufficiently big problem to justify making’ temporary migrants’ pay £200 a year towards their potential NHS costs. Clegg was unsympathetic with these criticisms. He argued that the funding of the NHS predominantly through taxation rather than insurance was unique: as a result there was a need for special provision for foreign users. The proposed £200 charge was reasonable compared to what other countries required in the form of insurance. He had had a deputation of students to see him and was following up their points. We also referred to the good services available to refused asylum seekers in Sheffield – through GPs and through the Mulberry Practice and the Transcultural Mental Health team etc. There was strong concern at our recent meeting about whether refused asylum seekers would still be able to obtain free access to GPs. Clegg promised to raise this with Department of Health colleagues. Immigration Bill – checks on immigration status. We pointed to the danger that landlords, banks and building societies, required to check immigration status, would take the easy option of discriminating against anyone against whom there was a doubt. Clegg took this point, and said that he was concerned about how the bill would work in the case of small landlords and it had now been agreed that this would first be piloted so that it would not come generally into force until after the General Election. Immigration Bill – Home Office workload. We pointed to the Home Office’s massive backlog of 430,000 cases, the fact that, according to the Home Affairs Committee, they only follow up 6% of tip offs from the public about irregular migrants* and the fact that they now face large numbers of cases of renewal of leave to remain. We suggested that the last thing that the Home Office needed was vast amounts of additional casework arising from the Immigration Bill. Clegg felt that at present the present system was in danger of being over harsh in relation to asylum seekers and too lax in relation to other migrants who over-stayed their visas but were not sufficiently chased up. He saw a need for exit records, so that the extent of overstaying could be properly monitored. 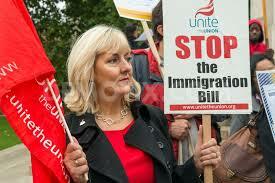 Immigration Bill – removal of appeal rights. We argued that the removal of numerous appeal rights for migrants (other than asylum and human rights cases) was most undesirable given that around 50% of appeals were currently successful, suggesting a high level of administrative incompetence. It was also a denial of justice and might lead to extra costs through an increase in judicial review. Clegg said that people in his own party had studied the existing appeal system and concluded that it bristled with complexity and caused delay. We disputed this. Clegg said he was not expert in this area and it was agreed that we would email him with our concerns which he would follow up. Lib Dem preparations for the election in relation to migration and asylum. We deplored the rhetoric employed by some politicians on these subjects and feared that this would get worse as the election approached. We asked what Clegg as Party Leader would do to ensure the avoidance of inflammatory rhetoric in his own party. 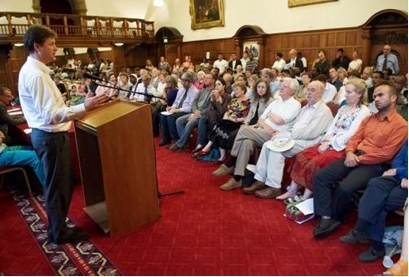 Clegg said that activists like ourselves must recognise that we could not have a tolerant society unless the public had confidence in the system, which had to be tough when necessary. But at present the system was excessively risk averse and lacked compassion in relation to asylum. He said that Andrew Stunell MP was leading a working group considering what the Lib Dems should say in their manifesto about migration and asylum. He encouraged us to contact Andrew with our views. 18. This part of the bill will damage Britain’s reputation in the world, as all migrants including students, highly skilled workers and family visitors will no longer be able to challenge wrong decisions. Those affected include those seeking entry or stay as ‘the brightest and best’, and those presently lawfully in the UK. Since the UK Border Agency has so recently been abolished as not fit for purpose, to place total confidence in immigration decisions without external redress is deeply irrational and damaging to community relations, our national life and economy. On November 8 three G4S immigration detention centre officials at Brook House were found to have forged documents relating to an asylum seeker who was about to be deported. It could have cost the man his life. On November 5 the Home Office announced a 30% increase in the G4S contract at …Brook House. The day before this Home Office endorsement of G4S, the Serious Fraud Office began its investigations into G4S and Serco (itself currently accused of sexual abuse at Yarls Wood detention centre). And all of this just 4 months after G4S were found guilty of unlawfully killing Jimmy Mubenga during his deportation. The Home Office issued a “qualified apology” for his death at the hands of G4S, which it had employed to do its forced deportation work at the time. During this time, SYMAAG’s John Grayson got to know more about life in G4S asylum housing in Yorkshire, meeting Esther, pondering on the gulf between a Parliamentary committee report and her young child counting rats in their G4S home in Living with rats. Landlord G4S. 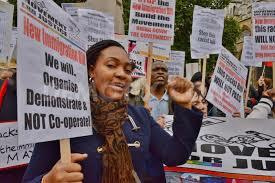 In a second new article G4S owes thousands of pounds on energy bills John shows how G4S is breaking the terms of its asylum housing contract leaving Esther and her daughter to “live in darkness”. Protests against G4S’ abuse of asylum detainees and of prisoners are global including Palestinian prisoners organisations and South African trade unions. 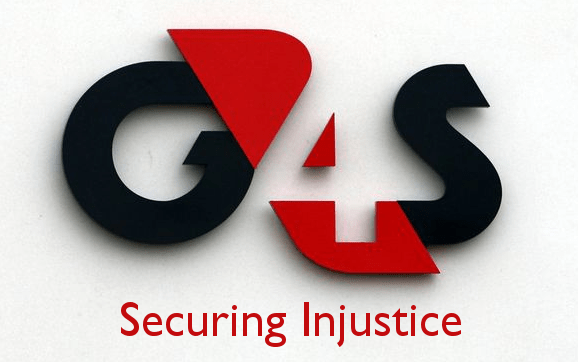 Stop G4S brings together all of those opposed to G4S taking over public services for private profit while violating human rights.